In a small saucepan add chili powder, oregano, cinnamon, allspice, and red pepper. Warm spices over medium heat until they bloom (smell really good!). (About 2 minutes) Transfer to a medium bowl and mix in potato starch flour and salt. In a small bowl add lime juice. Dip fillets in lime juice and then dip in flour mixture. Heat oil in pan and fry fillets for 2-3 minutes each side. Remove from pan and place in bowl for serving. Serve warm with any toppings you like and soft corn tacos. Salsa: Take whatever jar of salsa you like, mix it with equal parts of sour cream and serve. 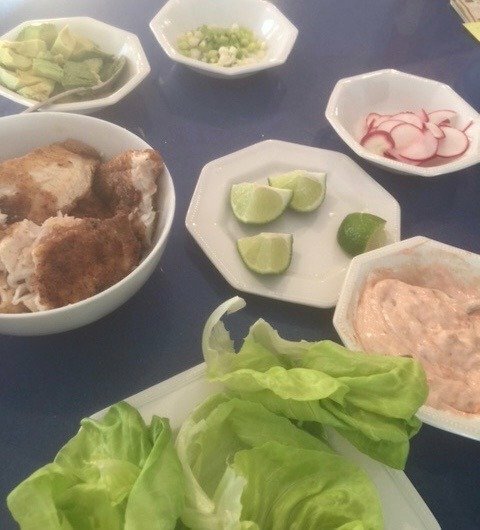 Thinly sliced radishes, chunky avocadoes, sliced scallions, lime wedges, and Bibb lettuce.